Today I am going to introduce you to this wonderful little facial hair removal tool called Epistick or Epicare. It is a Tweezer Stick in the form of a flexible spring, that pulls out facial hair. 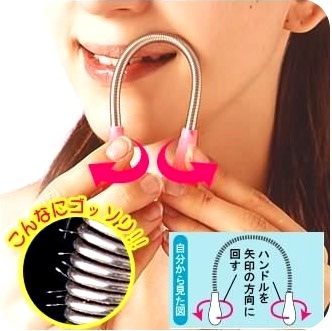 Need to run for a meeting, spending late hours at the office and not getting time to groom, just lazy to visit a beauty parlor frequently just to get unwanted upper lip hair cleaned up.... this tool is your answer to all these problems. It is a must have for every girl and can even be used by guys to remove unwanted hair near the cheek bone. A lot of boys have been writing to me to know how to remove unwanted facial hair on upper part of cheeks. 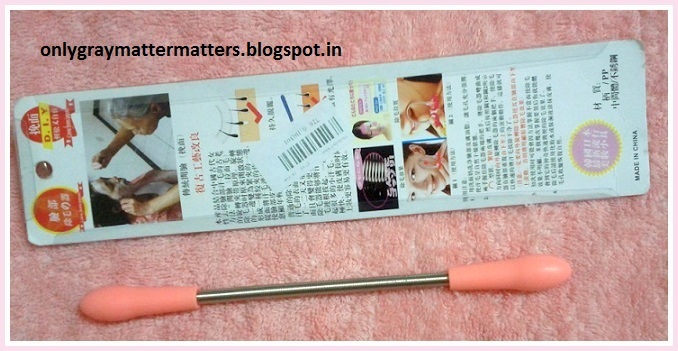 HOW TO USE EPISTICK FACIAL HAIR REMOVER? Hold the ends of the epistick between the thumb and first two fingers in each hand. Bend the spring to roughly form a 'U' and hold it against the skin where you want to remove hair. Roll the ends of the stick outwards and the spring will start plucking the hair. You can stick your tongue under the skin just like you do when getting your upper lip threaded. For better results, I hold it a little above the ends. Even if you do not understand the instructions, you will be still be able to automatically use it correctly once it is in your hands, simply by instinct. Always use on clean skin. It is important to use a mild toner on the skin after removing hair, to close the pores and to avoid skin infections. Do NOT use soap for 24 hrs. anyways it is not recommended to use soap on the face. Those who feel a lot of pain can also rub ice before and after hair removal. It effectively removes 99% of hair on the upper lip and 100% of the hair on the lower lip and on the contour of lips. Only the hair which are at an angle on both sides of the lips sometimes do not get pulled out from the roots. But after 2 days when they grow out of the skin, this tool easily plucks them out too. The more you use it, the better you will get at handling it and better results with each use. I have not gotten threading done on the upper lip ever since i have bought this tool. It is a facial hair removal tool and not just limited to removing unwanted hair around the lips. I personally do not find it safe to use near eyebrows or forehead as it may pluck your eyebrows or eyelashes or the hair on your head may get entangled into it. So it is completely up to you how and where on the face you can use it safely. 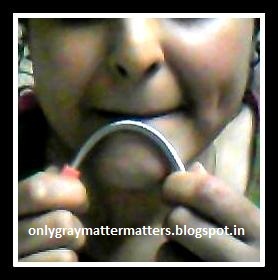 People who wax on the chin can also find it very useful though it requires some practice to use it on curved facial areas. 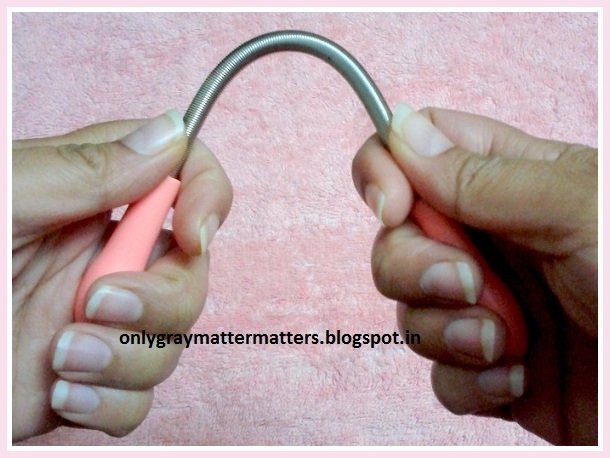 It is very handy, light weight and can be easily carried around in your purse all the time. You will need a mirror to be able to see and effectively catch all unwanted hair. It is completely up to you. People who have slow hair growth can use on alternate days or every few days. I personally use it more frequently because everyday some hair growth comes out of the under skin. It hardly takes 2 minutes to remove fresh regrowth. It is important to keep it clean and store it away from dust. After using, I gently stretch the spring and blow air through it to remove stuck hair. Then wipe with a clean tissue. Do not wash often or it may rust. On washing, lay it on a towel to soak all the water and air dry. A year ago, this epistick hair removal tool was available on ebay for more than INR 1000. I had bought it from ebay.in last year for INR 220 (Price INR 150 + Shipping INR 70). At that time buyincoins.com was selling a different version of this. I just discovered they are now selling this one too. Just like any hair removal method, this tool also carries the risk of hair root infections in very rare cases. It also depends on our pain threshold and thickness of hair. If you have never had your facial hair threaded or waxed before or if you have very fine hair, it may feel painful in the beginning. But it gives more satisfying results than threading or plucking manually with a tweezer. Also, our sensitivity levels vary on different days. When we are sleep deprived or in a low mood, we feel more pain. Women particularly feel more sensitivity towards pain during periods. So on a practical note, it is better to use it when you are feeling normal or good and in front of a well lit mirror. People who are prone to infections on waxing or hair removal, can rub the area with ice first to desensitize it and then remove hair. Else, you can apply aloe vera gel and let it absorb, and then use this. I once happened to use it during high sensitivity days and ended up with a really bad infection which took a week to burst and then left a scar. The mark is still there and may take a few more months to go away. But I find it safer, faster and more convenient than threading. Totally recommend it! OMG.. what a coincidence Gagan.. Yesterday, I got my parcel from bornprettystore and this was the product i have chosen, since i wanted it badly.. :) I have used it last night itself and agree with you said..
i saw it the other day on ebay and was unsure about the product... about safety and usage et all..
You are welcome Supriya:) I am glad this review came in time. It's a really helpful tool dear. O wow Ayesha! Happy to know it finally found it's way to you :) Yes, I love it too. Mine got damaged recently while closing the little cupboard door. I now need to get a new one. And I had bought from ebay as buyincoins didn't have it then. And you know, I had bought ACV from Healthkart on your recommendation. Thanks. Discovered your blog recently, and its been an amazing find. Came to know about many things which I intend to try. I'm a guy and I have this problem of Unibrow. First I was quite OK about it but now I find it problematic. Hence, my aunt used to thread it. It was quite painful, so I stopped doing it. Then switched to using scissors. I do it every 3 days. But it does not look as good as when done threading which is quite obvious. My question is 1.) Can I use this for my eyebrows? and 2.) Can Vedic Line Hair Retarder cream help me with this problem? 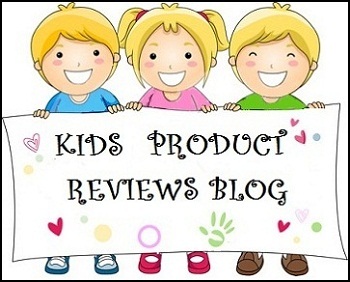 Thanks for this amazing blog and Keep up the good work. I think this tool is a little risky to use around eyebrows, the reason being you will need to hold it at a certain angle to be able to use it in the space in between the brows, which can get tricky and may pull other hair from the eyebrows too. I think the easiest and least painful way is to wax it and it is extremely easy to do at home yourself. One pack of waxing strips will cost you around Rs 35-50. They are paper-like strips but I think they are made of cellulose and are easily available at any beauty supplies store. One wax can costs around Rs 80. Both of these would be TOO much in quantity for you to ever finish them. All you need to do is to melt the wax a little over gas stove and then use a wooden ice cream spoon to apply that to the unibrow. Place a small strip cut out of a wax strip and press down in the direction of hair growth. Now just pull it off in the direction opposite to hair growth. Since your aunt knows how to thread, I am sure she can guide you with this. I too wax my forehead because on the sides my hair line almost used to merge with my brows and I have been waxing for 2.5 years now. It's not painful and results last longer. You won't need vedic line hair retarder for this. This spring tool sometimes also makes the hair roots swell, causing painful bumps that leave scars, if someone has sensitive skin. So if you consider waxing and need further help with waxing and removing those extra hair, email me a close up of your forehead with the unibrow visible so I can check how thick are the hair etc. Sorry for the late reply. I had sprained my waist and was unable to work the past couple weeks. You r simply supercool yaa !! Reading is so not me but your blog is irresistible, especially with the patience to each replies and details over queries.. you just make it very special. thanks a lot for this awesome blog. also guess you not logged in lately since im awaiting your feedback on essential oils too... that i enquired in hair care section. 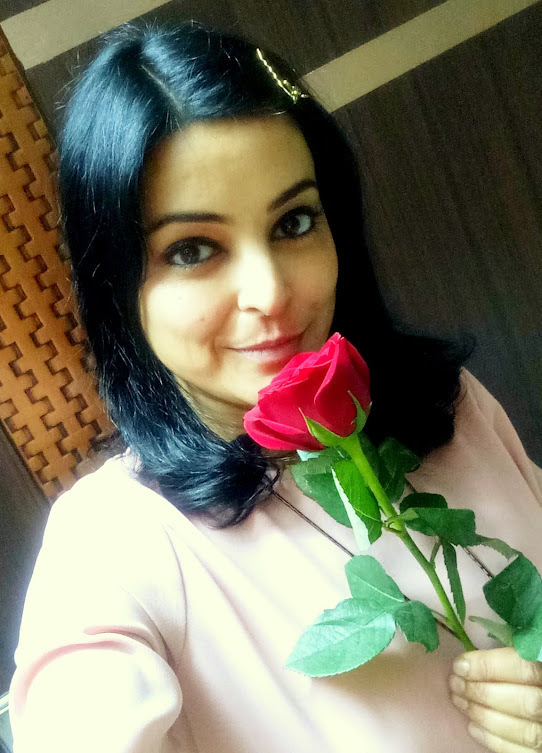 Thanks a ton Sreekala and really appreciate your interest in my posts. I am glad you enjoying reading through them :) Actually a broken wire in the phone line box was causing my internet connection to break every few seconds and it recently got diagnosed and fixed after a month. So yes, I am lagging behind in answering emails and comments :) Thanks for your patience dear. I just checked the Rs 98 listing and it is the same as mine. In fact they are all selling the same product and these are all made in China. There is one more company in the US by the name of Bellabe and I know the girl who market it in India, but that is priced at around Rs 1200 I guess. This one's not bad, never had any problems, so you can go for it without worries. Mine got damaged a few months ago and even I need a replacement. And yes, if your skin is sensitive, make sure you rub ice or some aloe vera on the upper lips/ target area a few min before you start using this. In between, I had started getting one painful eruption each time I used it and I am prone to such eruptions. So it had become a painful affair. But now I do it on days when my skin is not feeling that sensitive or ice and aloe vera always help. okies dear.. thanking is just not enough..